The Insignia Voice Smart Blue Tooth Speaker comes with the Google Assistant built-in. Thus, it should have all of the voice command capabilities of the Google Home. One way the Voice Smart one-ups the Google Home is its built-in alarm clock. This is a much-appreciated feature which provides a reliable use case for the device. The Voice Smart also features a built-in battery that can support up to five hours of audio playback. This allows you to use the device as a portable speaker any where you go. You can move the speaker to the kitchen where you can play music, set cooking timers, or get recipes from Google. 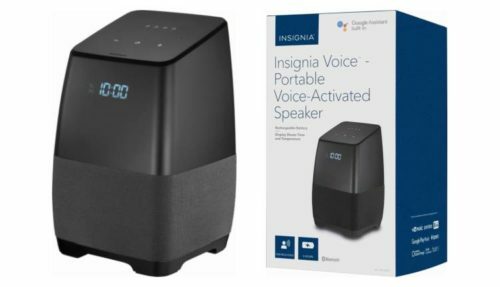 You could then return the speaker to your dresser or nightstand, listen to music as you fall asleep, and wake up with the alarm in the morning. Get traffic updates as you leave for work or play. Ask Google for homework help and even get movie times and secure tickets to venues etc.